Be the first to share your favorite memory, photo or story of LILA. This memorial page is dedicated for family, friends and future generations to celebrate the life of their loved one. 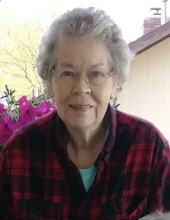 Lila June Cole, 82, was welcomed home by the Lord on January 23, 2019. She left her earthly home surrounded by loved ones. She was born on September 18, 1936 to Coy and Mildred Austin in Peel, Arkansas, and she resided in Republic, Missouri for the last 49 years. She was preceded in death by her parents, daughter, Ronna Cole, and son-in-law, Matthew Crim. She leaves behind her siblings Fred (Carol) Austin, Harold (Carlene) Austin, Lewis (Debbie) Austin, Lee (Emilia) Austin, Pat Cagle, and Pam (Leon) Due and her children Renita Nordyke, Garry (Judy) Cole, Millie (Jess) Webb, and Coy Cole. In addition, she is also survived by 13 grandchildren, 20 great-grandchildren, and many nieces and nephews. June was a dedicated employee of Kraft and retired after 23 years; however, her true passion was quilting. She owned and operated June Cole’s Machine Quilting in Republic for 46 years, and she continued to pursue her love of quilting until her passing. June was incredibly talented, and her quilts were a true work of art. Not only did June gift her entire family with her beautiful creations but also patiently taught many loved ones how to sew and quilt. Her quilts will be treasured by her loved ones forever, and her legacy will continue on as those she taught continue to pass on her love of sewing. June was also an avid reader, and she enjoyed sharing books with others. Family and friends who also loved to read rarely left June’s house without a bag of books. Additionally, she loved her flowers and gardening, and again, she was known to share her hard-earned produce with others. Most of all though, she loved spending time with her siblings, children, grandchildren, and great-grandchildren. They will cherish many memories of baking with June, family gatherings that always included homemade ice cream, and countless hours spent outside enjoying each other’s company. To send flowers or a remembrance gift to the family of LILA JUNE COLE, please visit our Tribute Store. "Email Address" would like to share the life celebration of LILA JUNE COLE. Click on the "link" to go to share a favorite memory or leave a condolence message for the family.